Creation I looks like a great fantasy book. How many books do you plan for the series? Creation I is an anthology of novellas I released for free to newsletters subscribers, and to fans paying attention to my blog on www.forsakenisles.com By releasing them for free prior to publishing each, I’m able to generate buzz, grow my fan base, and give special treatment to those who are really into it. This one follows the good gods. I plan to do the same with Chaos and Warp, and just keep going as I have time. It’s a lot easier to write shorter stories around the bigger works. It’s like a vacation for my brain. Many times, while writing the bigger books and especially in editing, I find tangents that make great fodder for these novellas. What do you think makes a great dark fantasy book? Let’s be real: it’s the anti-hero and the nature of the corruption. In our world, power corrupts and somehow our heroes in spite of their flaws, we know they’re going to triumph. Dark fantasy heroes triumph – maybe – not in spite of but because of their corruption. I personally think the best ones are where the character is not aware of or is caught off guard by their own corruption. In such a setting, villians drive the tone and they really get to shine. So much of fantasy is dominated by bright and shiny magic where rainbows, sunshine, and unicorns save the day. I have a four year old daughter. I’d never want to take that away from her. But, for me, I want my fantasy to reflect the deeper themes of what a world with magic would be like. I don’t think it would rainbows and sunshine. The temptation to use it for personal gain would drive many many of us towards megalomania. Heroes would be rare, not the norm. That’s what makes it dark: when a villain is forced to be a hero. What inspired you when writing Creation I? The main books of FI are from the perspective of the worshippers of Tiamat, an evil dragon goddess who wants to claim the world for Herself. Her worshippers have a certain view of this and I tell the stories from that view. Creation I is the beginning of expanding the world to show heroes of other gods, specifically the Good Ones, pitted against evil gods. I want this to become a full time thing. Step by step, FI’s world building and my own writing are advancing towards something special. It’s only a matter of time before stories like “The Healer’s Making” catch the eye of a publisher or agent, or I have enough momentum to go full-time. I have always wanted to be a writer. I don’t think there was ever a time where I didn’t want to write, or love fantasy. When writing Creation I did anything stand out as particularly challenging? I have been writing from Tiamat’s point of view – sympathetically – for so long that doing so without that sympathetic take was challenging. 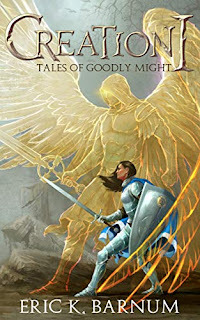 In “Everyday Angels,” the Queen of Tiamat’s Empire and one of the dragons visits the Temple of Angels. Writing those two religions, one Good and one covertly Evil, was a mind twister. How did you come up with the story in Creation I? From writing the other books, different secondary characters from different religions ached to have their stories told. The mythologies and legends begged for more depth but it wasn’t appropriate for those books. They fit well with their own dedicated novellas though and gathering these into anthologies made logical sense. Hiking is my thing as is gaming and hanging with my family. 2018 is just wrapping up and I have three daughters so closing out the year with them has been a highlight of also finishing this project.